Welcome to our website! As a parish, we seek to live out our Catholic faith by encountering the living God. We seek to grow in deep relationship with the Father, the Son, and the Holy Spirit through prayer and the Sacraments, and by knowing the truths of the Gospel and our Catholic faith. This knowledge is meant to be lived in relationship with God and one another. Join us as we seek to grow deeper in encountering the Lord through our Catholic Faith. Masses: Saturday 5 p.m.; Sunday 9 a.m. & 11 a.m.
Mass of the Lord's Supper 7 p.m.
Stations of the Cross in Polish 1 p.m.
Stations of the Cross in English 3 p.m.
Celebration of the Lord's Passion 7 p.m.
Easter Baskets Blessing 12 p.m. 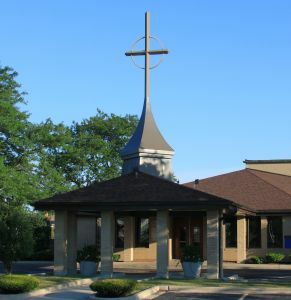 Masses 9 a.m. & 11 a.m.
Mass in Polish 5:30 p.m.
Hello from the Music Ministry members! We are excited to announce that the Worship Band will now be playing at two Masses each month! Please watch the bulletin for monthly announcements that will tell you when the Worship Band is going to play. We look forward to celebrating these upcoming Masses with you and we hope you are excited too! Thank you very much for all your support. ParishSOFT Family Directory - intuitive web-based interface easy for everyone to use, from staff to parishioners. Former electronic giving service 'ParishPay' is transferred into 'WeShare'.